Description: I've got a dog in there, kids, a multitude of toys and collection of muddy wellies - where do I start? 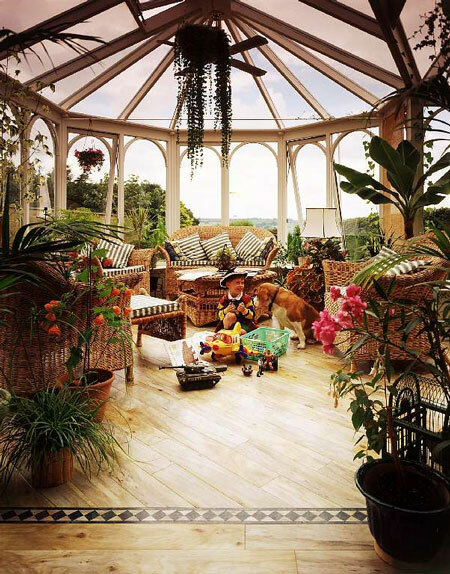 There can hardly be a more difficult room to choose a floor for than your conservatory - it gets hot in the summer, freezing in the winter, and is often the main access to the garden and way through to the rest of the house. Typical choices for conservatory flooring are stone, terracotta or ceramic, for their practicality and hardwearing features. Yet owners can find these floors are too cold in the winter, particularly where its not practical or too costly to install underfloor heating. Other traditional choices are natural woods, which look great, but can develop problems with warping and gapping, from extreme temperature variations. Amtico is warm and comfortable underfoot, won't crack as the temperature changes, nor warp and gap. Also, the colour is locked into Amtico tiles and it is guaranteed not to fade - so the colour you choose is the colour it stays, year after year.